This exquisitely illustrated volume is packed with professional guidance and master recipes for breakfast pastries, artisanal sandwiches, truffles and treats, and much more. Additionally, an entire chapter is devoted to the retail shelf, a key contributor to any café’s financial health. 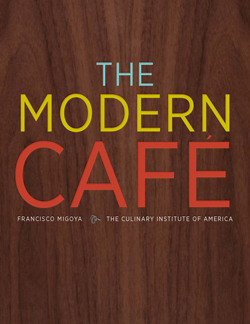 With information on all aspects of the café business-finances, human resources, food production, recipe/menu development, and even décor—The Modern Café offers both inspiration and instruction for anyone who wants to operate a successful café.